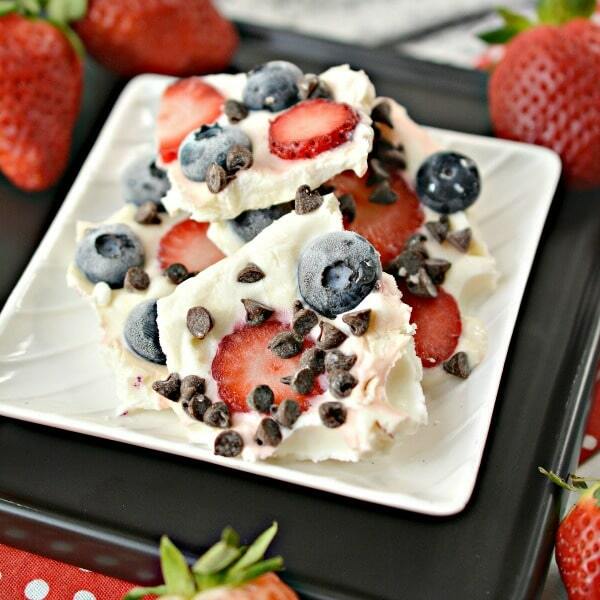 Chocolate Berry Frozen Yogurt Bark is so delicious you won’t know it is a healthy sweet treat! 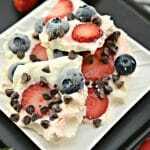 This easy no bake dessert idea can be made in advance and kept in the freezer until you are need it! WHAT IS FROZEN YOGURT BARK? Frozen yogurt bark is a very simple cold snack. It is just a yogurt mixture that has been spread out in a layer and then frozen. It is then broken into pieces and eaten! 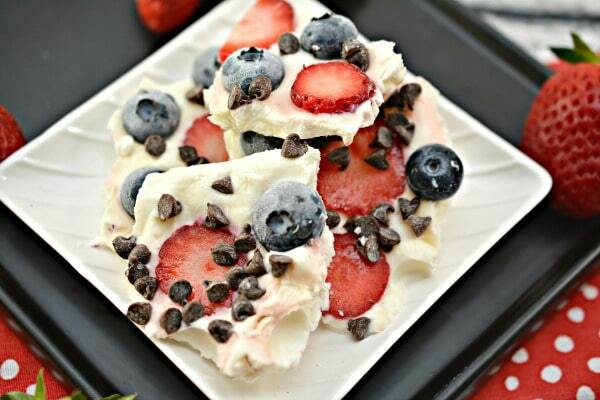 The great part about frozen yogurt bark is that it can be made a zillion different ways! 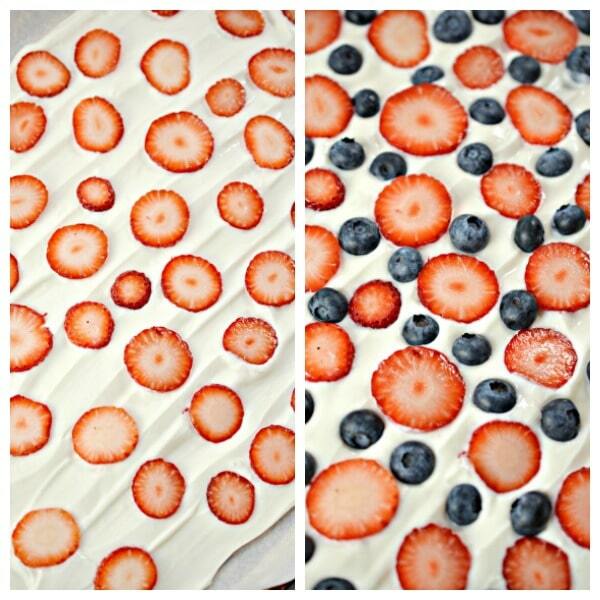 You can really get your creative juices flowing when you start making frozen yogurt bark!! I have a little tiny weakness for chocolate. There is a lot less guilt involved when I eat Chocolate Berry Frozen Yogurt Bark instead of a candy bar!! The combination of chocolate and berries make this absolutely fantastic. 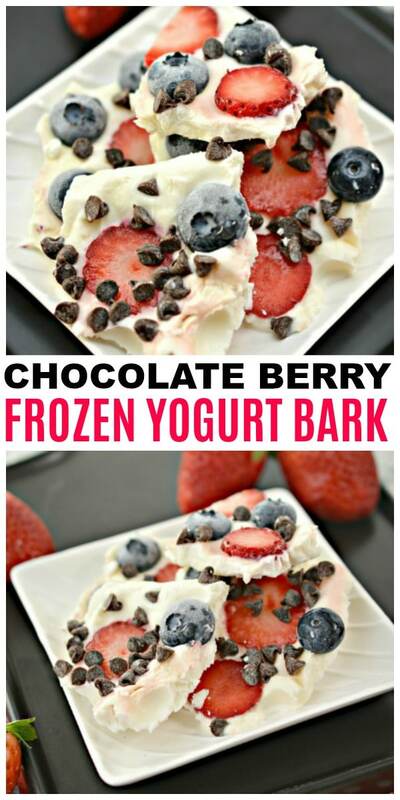 It is so nice to know I have some of this Chocolate Berry Frozen Yogurt Bark in the freezer when I get a sweet craving. Making a double batch of this recipe allows everyone in my family to be able to grab a piece when they want to! It keeps perfectly in a freezer bag or container. This simple recipe only has 6 ingredients and many of these I always have on hand at home. There is also no need to heat up the oven for this one!! I love no-bake recipes. This is also a great recipe to have the kids help you make. Grab some parchment paper . Cover a cookie sheet with the parchment paper. 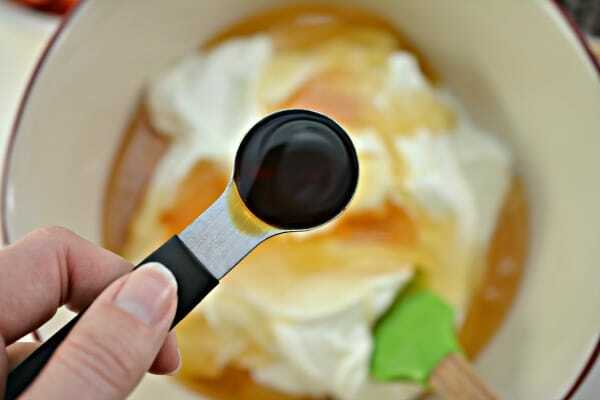 Now you will put the yogurt, vanilla and honey into a mixing bowl and mix to combine. Take the yogurt mixture and spread in an even layer on the cookie sheet. Make the layer thick enough that it can support the weight of the fruit! Now it is time to put a layer of strawberries on top of the yogurt mixture. Then go back over with a layer of blueberries. Sprinkle the mini chocolate chips over the fruit and yogurt. If you want a little extra sweetness you can drizzle some extra honey over the top at this point. It is time to place the cookie sheet in the freezer to set up. The minimum amount of time it needs will be 3 hours, but it is easier to break into pieces if it can set up all night long. When you take the Chocolate Berry Frozen Yogurt Bark out of the freezer, break it into bite sized pieces. Store any extras in an airtight freezer container for up to a week or so. I know you are ready to make this delightful dessert! You can download and print off the full ingredient list and recipe directions below on the recipe card. 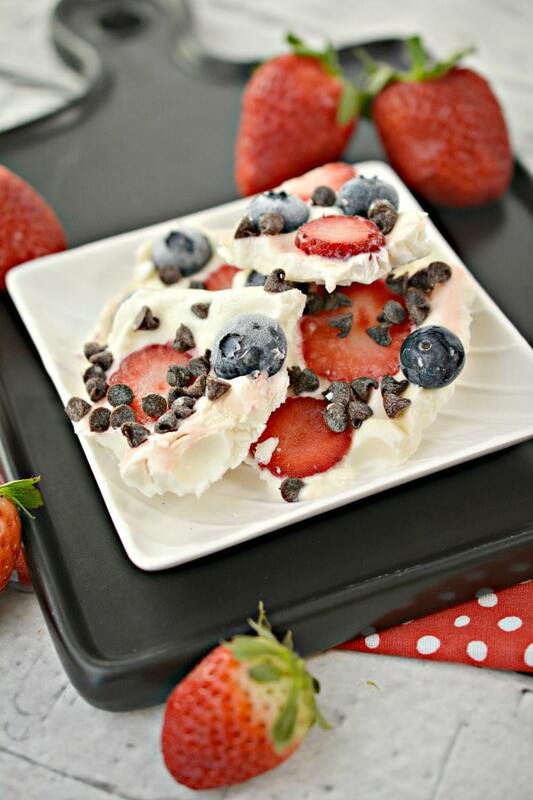 Chocolate Berry Frozen Yogurt Bark is a simple dessert recipe that is no bake and only has 6 ingredients. Add the blueberries on the surface of the yogurt as well. Don’t forget to PIN this recipe so you can come back and make it over and over again! 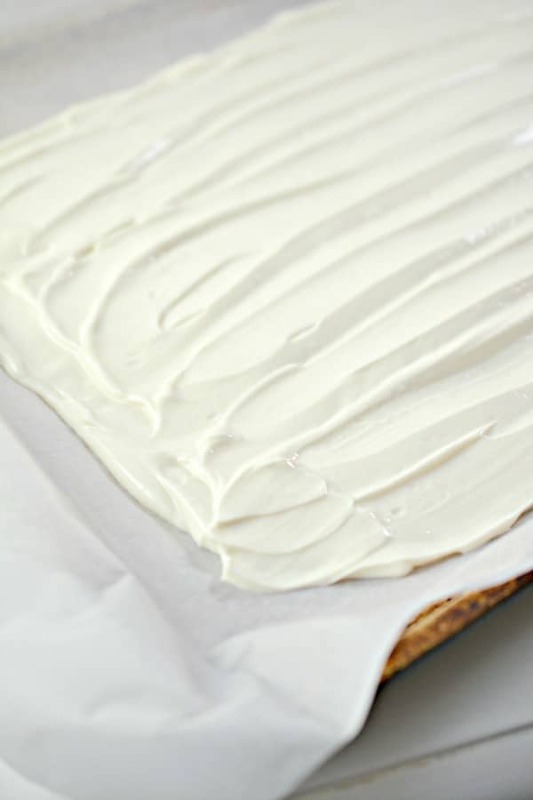 Your Yogurt Bark looks very special we will love this recipe! Thanks so much for sharing with us at Full Plate Thursday and hope you are have a great week! I’m imagining myself eating this on a hot summer day. Fresh berries are around the corner. I’ll be Pinning this post, my family will love it. Thanks for sharing on Sunday’s Best. Sounds as good as it looks! Thanks for sharing at the What’s for Dinner party – have a wonderful weekend. Looks delicious and I am adding this to my recipes board for later. Thanks for sharing it at #omhgww! These sound delicious and like such a healthy alternative to ice cream or chocolate. Pinned.